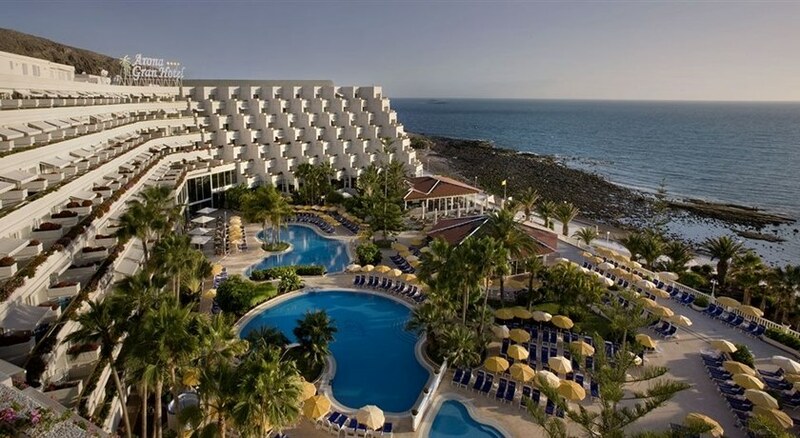 The Arona Gran Hotel is a four-star, adult-only hotel situated in the bay of Los Cristianos in southern Tenerife. It is an ideal location for a perfect vacation for couples or honeymooners. The best part is that it has a beach nearby where guests can have lots of fun in the sun. The guest rooms have private balconies offering beautiful views of the sea and the harbour. The hotel has two large stunning pools surrounded by palm-dotted terrace. The restaurants offer tasty meals in the seafront and an evening piano bar and show lounges are also available for entertaining the guests. 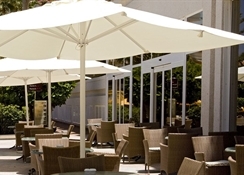 The Arona Gran Hotel’s exclusive benefits include a free taxi ride from Tenerife South Airport and free coffee and tea facilities upon a minimum stay of 7 days. Free Wi-Fi throughout the hotel complex upon early reservation. 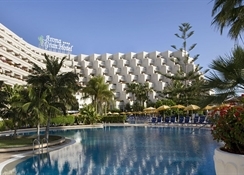 The hotel is located on the Los Cristianos port in Tenerife, Spain. The Los Cristianos beach is at a walk of 12 minutes from the hotel. The Tenerife South Airport is the nearest to the hotel at about 18 km. Shopping centres, bar and restaurants are at a distance of 50 metres. The seven-floor building has six lifts and 391 rooms. All the luxurious rooms are air-conditioned with private balconies offering beautiful sea view. Bathrooms have bathrobes, slippers, hairdryer and all other amenities. Room facilities include 32” at-screen TV with satellite channels, in-room safe, minibar, free Wi-Fi, telephone, cosmetic mirror and desk. Rooms with disabled access are also available upon request. The UP! Rooms are specially upgraded rooms with best sea views and the access to the stunning rooftop having an infinity pool with drinks and snacks. Apart from these, there are UP! Suites, Double Side Sea view rooms, Double pool/sea view rooms and adapted disabled rooms. The Las Vistas buffet restaurant at the hotel serves guests delicious breakfast and live cooking dinners. The Palapa Bar also serves continental breakfast for those who wake up a bit later. There are many bars throughout the hotel, which serve refreshing drinks all day. The pool side bar is the perfect spot for having a cocktail while viewing the beautiful sunset by the sea. The Las Vistas restaurant requires a special dress code of long trousers for men after 6 pm. But, during summer months, knee-length shorts are also permitted. Romantic dinners can be availed at the Culinarium, which is the A la Carte Restaurant of the hotel. It serves delightful cuisine both local and international. Early reservations are required for this restaurant. The hotel has two outdoor swimming pools near the sea. The pool water is purified by salt water chlorination, which prevents skin and eye irritation. Couples can enjoy a Bali-bed service and a Cava bottle with a sea view for just 20€ a day. The hotel also has a Gym facility where a fitness instructor helps the guests develop a fitness plan. The gym has advanced Technogym machines in addition to 5 bikes, 5 treadmills and 2 elliptical machines. The fitness classes take place 3 times a day with the fitness instructor. The hotel has a large stunning golf course, which can prove to be a perfect spot for a golf lover. The Spa-Thalasso Arona Gran offers luxurious Spa treatments. Guests can choose from a wide range of treatments such as massages, facials, body wraps and much more. Moreover, leisure activities include indoor bowling alleys, live music shows and other entertaining programmes.